These baked apple strings taste exactly like freeze dried apples. 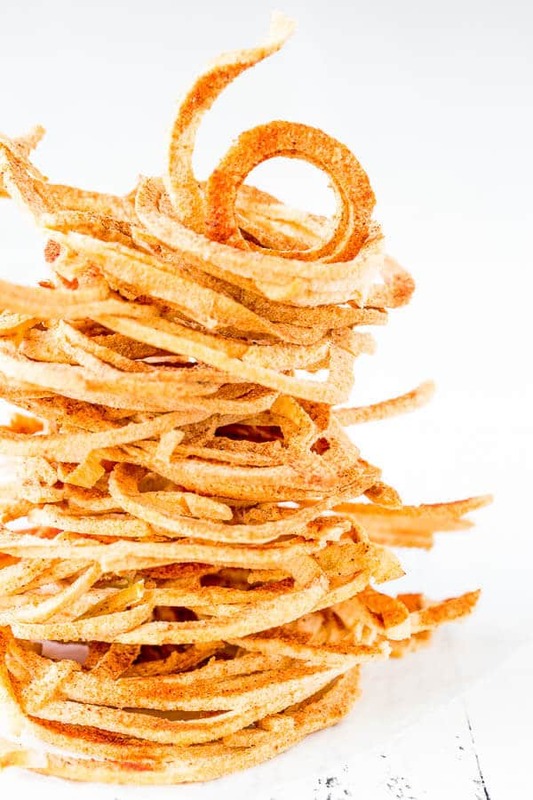 So light and airy, crispy and addicting! And the best part is no special appliance required, just your oven. Did you go apple picking yet? We don’t have recreational apple orchards around here, but we do have our own little one at the ranch. Our apple trees did so well this year, yielding overwhelming amount of juicy, tart and big apples. We have so much that we don’t even know what to do with them. Well, we didn’t know until my mother-in-law started making amazing apple chips. 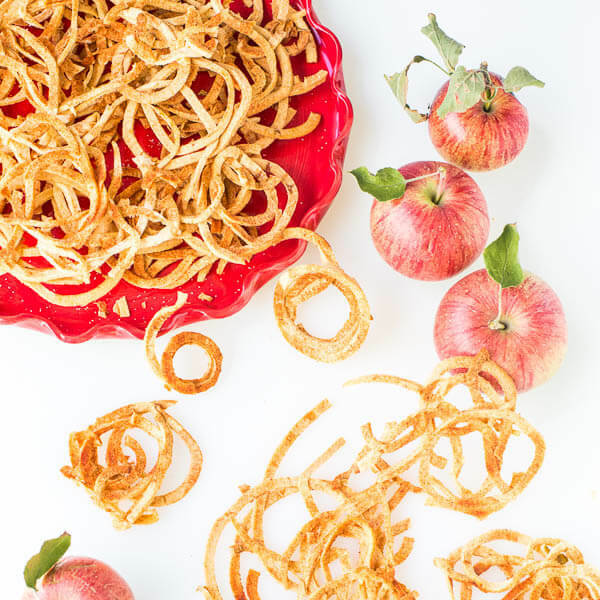 Chewy, sweet apple chips with sprinkle of sugar and cinnamon… Super addicting stuff! I don’t even know how many apples I’ve consumed in the last week, because I munch on these things non-stop!! Since my consumption is out of control, I decided to start making apple chips myself. 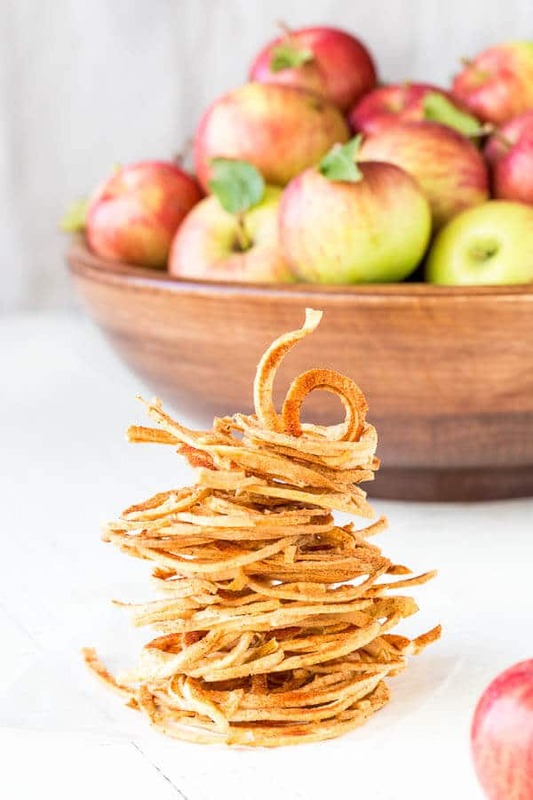 So how to make apple chips at home you ask? Well, the good news is it’s super easy to make them. If you have one of this bad boys, it’s pure joy to peel, slices and core the apples with just one step! And if you’re working with lots of apples, a big dehydrator doesn’t hurt either. I use this one, but it’s completely unnecessary for today’s recipe, because we’ll be using oven. So, in my obsessive-apple-chips-making-craziness, I learned couple of things. There’re 2 different types of apple chips, both equally addicting and delicious: 1. satisfyingly chewy, and 2. light and crispy. And the temperature at which you dry your apples makes a significant impact on the final result. Super low and slow dehydrating process (we’re talking 135°F!) yields satisfyingly chewy apple chips. 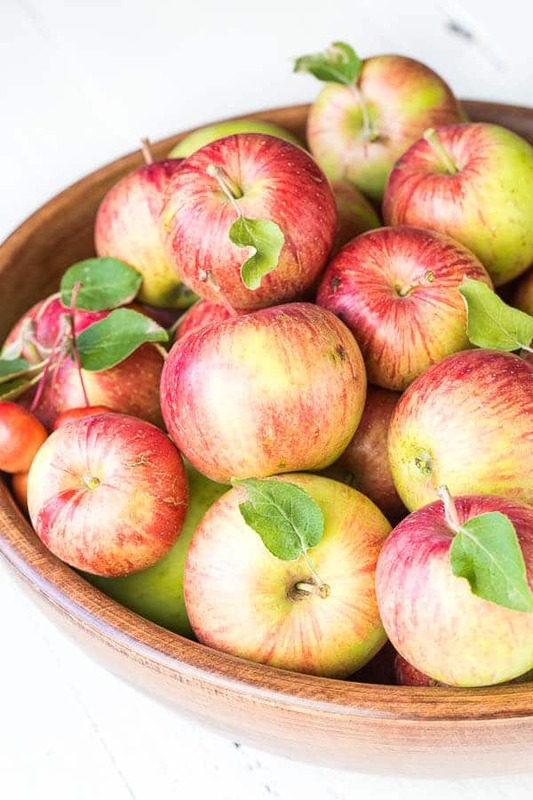 But if you crank the temperature up a notch (200°F, to be specific) and cut the apples thinner, you’ll get super light, melt-in-your-mouth crispy (does that even make sense?) apple chips. If you’ve ever tried freeze dried fruits, you know exactly what I’m talking about. Dare I say, you get freeze dried apples without any special appliances? You betcha! When I got bored with same old apple slices (did I mention I had ton of apples? 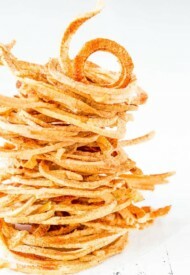 ), I wanted to try something different and made apple “noodles” using my spiralizer. Plus, I popped them in the oven. And let me tell ya, the apple strings turned out simply amazing! I was shocked how different the texture was from the apple chips I made in dehydrator. As for sugar and cinnamon, it’s totally up to you. You certainly don’t have to use it, but it adds a nice touch. I can see myself adding these to my cereal, cookies, granola mix (well, unless we eat them all that is). It’s just so darn hard to keep our hands off of these! Good thing, they’re healthy! Now you know what you’ll be making with all those apples you picked at the orchard. Don’t forget to share your pictures with me! These baked apple strings taste like freeze dried apples. So light and airy, crispy and addicting! And the best part is no special appliance required, just your oven. Wash and peel the apples. 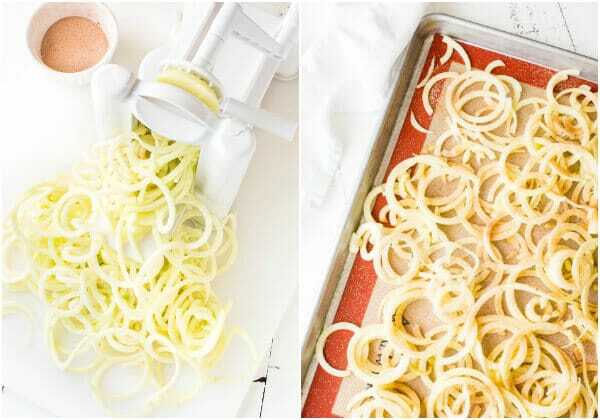 Using a spiralizer with ¼-inch noodle blade, cut the apples into long strings. Evenly layer the apple strings on 2 baking sheets lined with silicone mat. Try not to overcrowd the pans. Bake the apples for 4-5 hours, or until they’re nice and dry. Turn the heat off, and let it cool in the oven. Once cooled completely, transfer into a ziplock bag and store at room temperature.